The 1988–89 NHL season was the 72nd season of the National Hockey League. Twenty-one teams each played 80 games. The Calgary Flames won an all Canadian Stanley Cup final against the Montreal Canadiens four games to two. To date, this is the last time two Canadian teams squared off for the Stanley Cup. 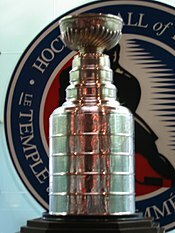 The Stanley Cup Finals was decided between the top two teams during the 1988–89 NHL regular season. Captain Lanny McDonald scored the second Flames goal in Game 6. This turned out to be the last goal in his NHL Hall of Fame career because he retired during the following off-season. Doug Gilmour scored two goals in the third period, including the eventual game and Cup winner to cement the victory for the Flames. This page was last changed on 25 August 2018, at 00:48.